I guess it's a cliche to refer the 1980s as the "golden age of British Gaming". But for many of us who grew-up playing games on an 8-bit computer, it truly feels like it was just that. 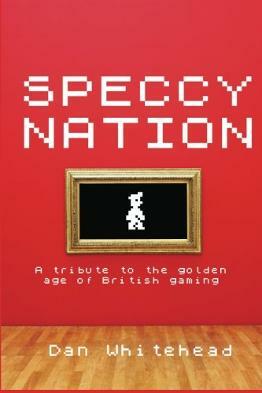 In the amusing foreward by Phil South, the author sums up Dan Whitehead's publication very nicely as "A tribute to the Speccy, that slightly potty king of home computers". Indeed, the ZX Spectrum with its quirky rubber keyboard, clashing colours, and screeching one channel sound was certainly an eccentric device, and one that was British to the core. This was an era when being made to use your imagination was not a choice when it came to a ZX Spectrum game with it's simplistic graphics. But as basic as they were, the computer-generated sounds of the 80s were, in my eyes, how computer games should sound, and the games themselves had an addictive quality that has been lost in many of today's graphically impressive games. But as basic as the games were, the computer-generated sounds of the 80s were, in my eyes, how computer games should sound, and the games themselves had an addictive quality that, I believe, has been lost in many of today's graphically impressive games. In this celebration of ZX Spectrum games, Dan explores an interesting range of classic titles including, I'm pleased to say, Bug Byte's popular platformer Manic Miner, a firm favourite of mine, and as Dan states "the quintessential Spectrum game". Also reviewed is the sequel Jet Set Willy, which is set is Willy's huge mansion. The Classics - Spectrum games that set the standard. The Pioneers - Spectrum games that Broke the mould. The Greats - Spectrum games that stood the test of time. Never Again - The games that would never be made again. This is also a very useful list of speccy related nostalgia websites. Also included is the frantic and impressive shoot-em-up Cybernoid, and a couple based on Liverpudlian pop stars, which are the surreal Frankie Goes To Hollywood video game, and Paul McCartney in the ill-conceived Give My Regards To Broad Street. It's interesting how may of these games I had almost forgotten about, and just how diverse the range of titles was. In our sanitised, politically correct world, many of the ideas for these games - which sound like they were dreamed up by a spotty teenage bedroom coder who'd taken an e pill with his cherry cola - would certainly never see the light of day today, that's for sure. This is a very well written book from a gaming author who knows his stuff - Dan was once a staff writer for Amiga Computing Magazine, and has written for Retro Gamer. He was also a gaming consultant for Guinness World Records, and is currently a writer for Eurogamer. I enjoyed this guy's writing style which is very engaging and always enthusiastic, and I found myself totally absorbed and eager to get to the next page. Dan adds his own critical eye to each game, as well as explaining in detail what each one is about. This is an essential nostalgia fest for retro gamers who yearn to go back to the golden age of gaming.